This seafront vacation residence, typifies simple yet classy contemporary tropical architecture. Interiors are appointed with mostly stylish, deliberately weathered wood furnishings merged with contrasting, carefully chosen classic and ornate pieces. While amenities are intentionally top-of-the-line for each and every guest’s utmost satisfaction. This exceptional villa comprises of 4 double bedrooms in total, a wide range of indoor and outdoor living and dining areas, private swimming pool with jacuzzi and is surrounded by a spacious 2000m2 tropical garden and coconut grove. The property has two buildings with a total space of 750 sq meters. 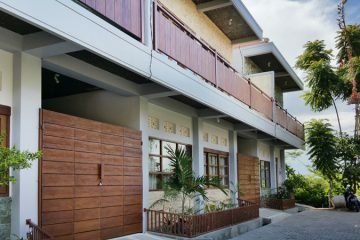 The main house contains a spacious air-conditioned living room, dining room and kitchen, one bedroom with private terrace and gym on the ground floor and a very big master bedroom with balconies and sitting space on the second floor. Two guest bedrooms located in a separate pavilion face the garden and pool. All rooms at the villa have fantastic sea views. There is one cozy terrace just next to the beach with sun umbrella and two loungers for those who like to enjoy ocean breezes and breathtaking views. Truly, this villa rolls out for you swanky, in vogue and modern living amidst remote, seaside surroundings. It is perfect for a group of friends or a big family and can comfortably accommodate up to 12 guests. Your personal chef and driver with car will make your Bali holidays unforgettable and we also have housekeepers, gardeners and a pool cleaner. Located only a few steps away from the main street of Candidasa with it’s shops, restaurants and diving centers and with access to a white sand beach.